The Sixteen Days to End Violence Against Women are upon us. White Ribbon Day has come and gone, yet where is the press coverage? Where are all the white ribbons? It’s not too late. The endless fight to prevent violence against women worldwide is in desperate need of support. In the UK funding for domestic abuse services is being cut by 100%. Join us in calling the Coalition to ring-fence domestic abuse services, and to ensure that local aid centres don’t close. Women need to be able to access these services: 1 instance of domestic abuse is reported to the police every minute, and yet it’s reckoned that only around 30% of cases are reported; think how many more women there are out there suffering in silence. Education, too, is essential. Rates of teenage girls suffering from domestic violence, perpetrated by their boyfriends, remain high. This is not a new issue. Yet it persists. The UN is conducting a campaign called Say No to Violence Against Women. It coincides with a flurry of drives to raise awareness, and to raise money, to combat these crimes. You can donate here to give money to UN Women to support women worldwide suffering from violent abuse, or you can pledge to take action here. Alternatively, you can donate to YouFem: we’ll be using any donations to spread the campaign and raise awareness across London; we’ll also be giving to Advance, a women’s charity dedicated to providing legal aid, shelter, housing and advice to suffering women. It could be you in these photos. 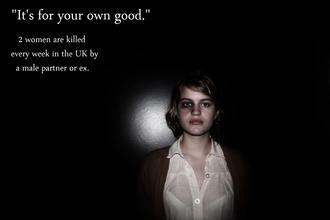 It could be your daughter, your sister, your friend, your neighbour. Domestic violence. It’s not normal, it’s not acceptable. Say No. Somewhere, in the the quiet hinterland that is my corroded mind, lies a memory that tells me that about 35% of those that suffer from domestic violence are men. Could someone tell me if this is an accurate figure? Also, would it be around the same depressingly small fraction (30%) that get reported? Higher? Lower? Hi! I kind of hate myself for picking holes in such a worthy campaign but I have to ask: why are the models in the posters all young and white? Is that because young, white women are statistically the most represented amongst domestic violence victims, or because members of the public are more likely to sympathise with young, white, conventionally attractive women? This isn’t an aggressive criticism, it’s a genuine question. Also, I’ve got to say, I might not have consciously noticed this if it hadn’t been for the photo descriptions – food for thought indeed. These days women are being treated as objects and are violated around the world. Maybe there will not be an immediate change to the way women are being treated. But the message is passed on through these campaigns. Campaigns are effective in sending out the message and it will reach a larger audience. @SexierThanThou the short answer is no, it’s lower than that. The medium sized answer is that it depends on how you define domestic violence and how you measure it, but the most meaningful measures come out with a greater gender disparity. The long answer: various academics use measures like the Conflict Tactics Scale (CTS) to measure DV. These typically ask people whether they have ever perpetrated certain aggressive *acts* against their partner, from shouting to stabbing. These tend to come out with figures like the one you gave. However, domestic violence isn’t about hitting, or even about shouting; it’s about having control over the person, and exerting power over them. A slap isn’t abuse unless it means something controlling: e.g. instils fear, humiliates, punishes, etc. Measures like the CTS don’t acknowledge this. As a result they mis-code various aggressions as abuse, some of which will be horseplay, and much of which will be women defending themselves or retaliating against their abuser. Hence skewing the gender ratio. Measures which give a clearer picture of the gender ratio include all the other ways you can control someone, other than physical violence, and also measure the impact of those techniques. E.g. Have you ever felt afraid of your partner? Does your partner ever try to control who you see or what you wear? Has your partner ever deliberately destroyed your possessions? These measures generally find that women perpetrating domestic abuse against men is a much much rarer than the reverse. I only have two quick q’s really, if you have the time to indulge me. Firstly, it seems like these ‘measures’ would be extremely difficult to measure with any degree of accuracy, the intangibles I mean. As a research student (one who has never researched such a topic) I just wonder if these intangible measure lead to ‘researcher contaminating the research. Sorry to get all tree falling in the woods. Secondly, wouldn’t ‘male abuse against males’ and ‘female abuse against females’ have a balancing effect on the overall figure, even the intangible, “control” measures? I just wanted to quickly address JS’s comment (I’m current Chair of YouFem). We were rather annoyed and embarrassed that all our models ended up being white, and that definitely wasn’t what we were aiming for; there was supposed to be an ethnic mix, but it just happened that on the day, the girls who turned up to be photographed (all members of YouFem) were all white. As for their age, we’re a youth organisation, and one of the aims of the campaign was to draw attention to the recent rise in rates of domestic violence perpetrated against teenage girls by their boyfriends. This all should have been made more clear, with a disclaimer or something.